Absolutely fabulous Sylvie - love the background doilie and the gorgeous bird image. The view from your window is amazing! 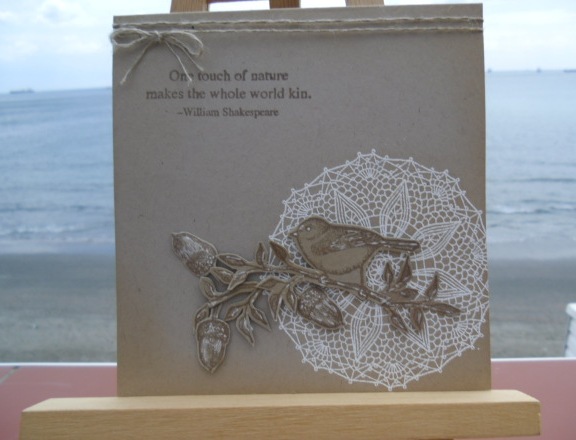 It's lovely, the image is really nice and the doily just sets it off against the brown. Love the card, colours are great. OMG another totally gorgeous creation - sorry I've not been around much been away at the weekend so only now just catching up with commenting! So elegant Sylvie, very pretty. Gorgeous card Sylvie and I'm glad the wind didn't spoil it. This is lovely, I particularly like the white doily stamp. This is another stunner Sylvie, what a beautiful card thanks so much. Love these colours and that doily stamp is fab! You have a lovely blog Sylvie and lots of gorgeous cards. Your view is pretty amazing too - I would never tire of looking at that. Beautiful card, lots of wonderful texture, and the bird die cut is fab! And I read your profile, I'm packing a case now lol...and is that the sea!!! You are on a beach!! Oh goodness. How fab! so you should be pleased - it's gorgeous! Sylvie love both your card both so pretty and so different.